« …And More Happy Days! Hey guys! 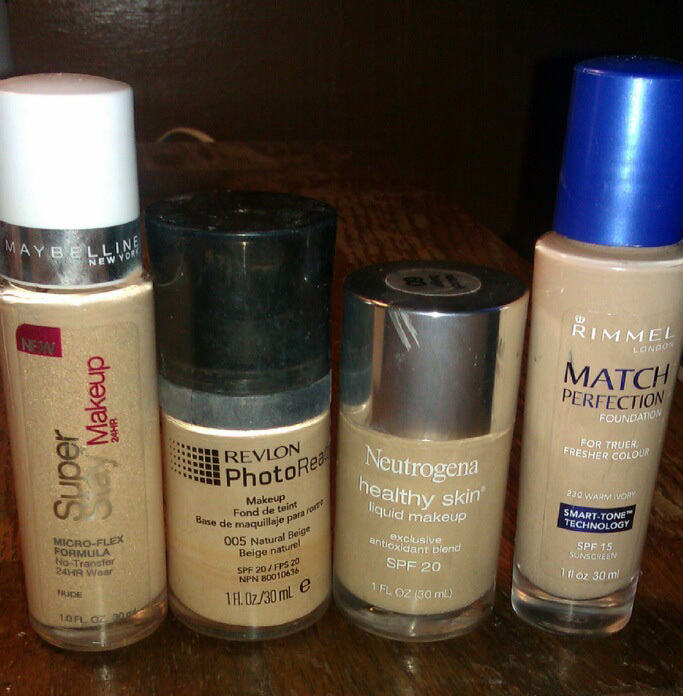 I know my posts have been very far and in between but today I’m going to go over some of my favorite foundations, some that just get me by, and the ones I don’t reach or that often. Lets start with the not so great ones, I’ve only got three of them. L’Oreal Magic Smooth Souffle- So my issue with this one is… I don’t have the smoothest skin in the world and i know the foundation promotes smooth skin… But you have to have smooth skin in order for it to work effectively. The coverage is about a medium coverage not that great, and its kind of drying. So my Combo skin girls or dry skin girls STAY AWAY! Revlon Photoready Airbrush- I am a photoready fan, I really like the original formula so when i saw this i thought why not try it out? It’s not as glittery as people have made it out to seem. My issue with it is….the coverage. Im a full coverage gal and it doesn’t offer as much coverage as i would like and if you don’t pair it with the right powder it can become very streaky and oxodize like crazy! When paired with my blu ray cargo powder its amazing. But still this one isnt one of my favorites. Sorry Revlon. Neutrogena Skin Clearing- Now I know it has salicylic acid in which is supposed to clear acne up by drying it out. Now like I have said before im a Comboniation Skin girl but for me this dried me out really really bad, and was just awful looking. The coverage is crap and totally sheer after an hour or so. Just not worth it for me. 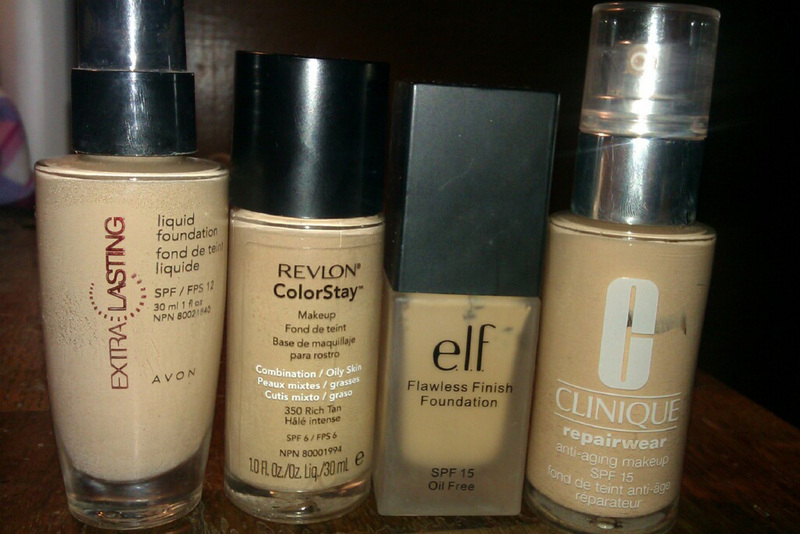 Now we’ve got the mediocre everyday foundations. Rimmel Match Perfection- So this one is a hit and miss for me. Somedays I absolutely love it and it makes my skin look great, and some days it fades after a few hours. But I still really really like it. No other complaints or praises. Neutrogena Healthy Skin- So after hearing nothing but praises about this on youtube I had to go out and buy it. I really really enoyed it at first. I used it the other day and it was just kind of eh. I think it might be the condition my skin is in. So once ive cleared up I will try this out again. Maybelline Super Stay- The only thing I don’t like about this one is that its not full coverage its a medium coverage. Other than that its awesome. Does exactly what it stays and is great for those long days. Revlon PhotoReady – This is the original formula, and I love it. It was my go to for about six months and I used it everyday. I’ve re purchased it multiple times and will continue to. But once again my skin is in bad shape and just doesn’t cover everything I want it to. So once im in better shape again I can gurantee it will be a favorite again. Maybelline Dream Matte Mousse- This is the original in a jar one. Now unlike the L’Oreal one its very full coverage, and doesn’t make me look bumpy and dry. It makes me look smooth and definetly matte. My only complaint is the longevity of this product. Its not a longwearing foundation. Now on to my favorites!!! Yay finally. Revlon ColorStay- what more can i say? 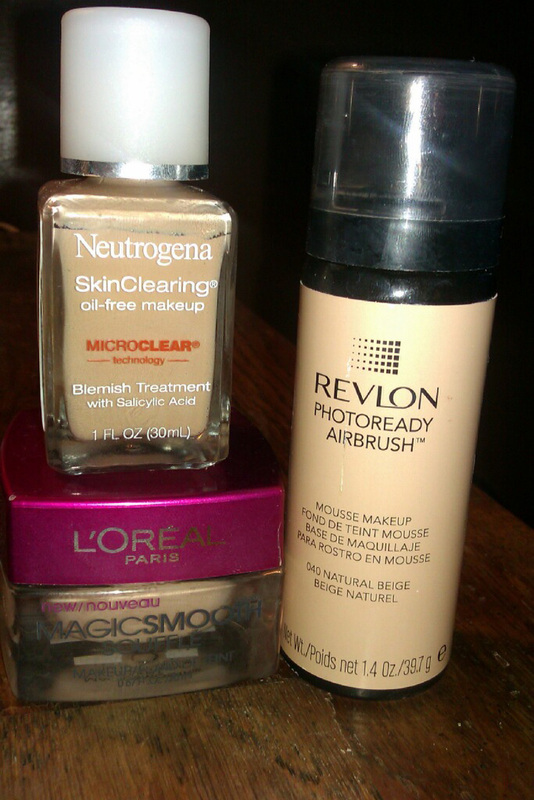 this is my HG lasts all day foundation i love it… I also love that it has an option for combo skin, or oily skin. Avon Extra Lasting- The name says it all. This foundation truly does last all day. Very Very full coverage doesn’t break me out. Just overall great! Elf Flawless Foundation- For only 6 bucks this is great. Its very lightweight yet offers me the full coverage I love. Clinique Repairwear- So this is one of the only HE foundations I have. It’s been a favorite of mine for about four years now. I have re purchased it about three times. But I recently heard they re formulated it. But this one is amazing its very full coverage doesn’t crease into my fine lines and is defintley for the matured skin women. phew sorry that was so long! I hope it helps and gives you some more insight in to the wonderful world of foundations. Hope you are have a wonderful day wherever you are!